Nine-year-old Ivy Brooks interviewed As It Happens host Carol Off about journalism, social justice and the newspaper she's starting: What's In Your Pocket. As It Happens receives a lot of emails, but a handwritten letter is a rarity. A letter asking to interview the host is even rarer. 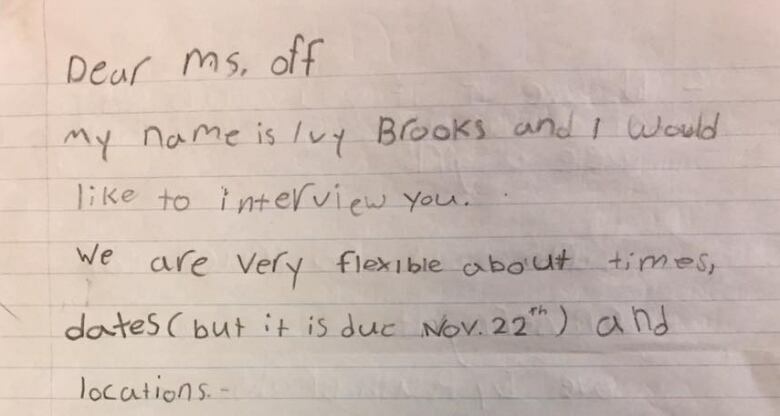 Ivy Brooks, 9, sent As It Happens host Carol Off a letter with that very request. Ivy is in Grade 4 at the Linden School in Toronto and has to interview someone for a school project. But this cub reporter didn't just leave it at a letter. After not hearing back from Off, she left a voicemail with a reminder of her deadline. That did the trick. Ivy sat down in the As It Happens studio, sparkly pink notebook in hand, to ask Off about social justice, journalism, women's rights and more. Here is part of that conversation. Do you mind telling me, how did you start your career? I started when I was in university and I had no plans to be a journalist. It was the last thing I wanted to do. I wanted to be a famous novelist or a poet or something. There's a newspaper at my university, this was at University of Western Ontario in London. And the newspaper was called the Gazette. And it was awful. It was just so bad. I would say, "This isn't even worth picking up." It was free and I didn't want to take it, it was so bad. So my friend said to me, "Well, if you think it's so bad why don't you go and write and make it better?" So I went in and started working for the student paper and I got hooked and I became a journalist. Something that I'm actually doing is I'm making a newspaper for the town that I live in. Yeah. So I haven't quite made the copies yet. My town's called The Pocket. What kind of stories are you going to do? Just what's happening around and it's called What's In Your Pocket. What's your favourite part about being a journalist? My favourite part about being a journalist is exactly what you and I are doing right now — interviewing people. That's the best thing. You get to ask them all kinds of questions and they have to answer. And if they don't answer, they squirm or they look uncomfortable or they try and get around your question, and you have to pull them back and say, "You didn't answer my question." I love doing that. Have you ever been scared when you were, like, interviewing someone? Have I ever been scared? You know, often. I'm scared right now ... and I'm being interviewed. You're making me very nervous. I don't know where we're going with this conversation. You could ask me anything and I'd have to answer. At my school I'm going to have a social justice data fair and what do you think is, like, the most social justice thing happening around the world? Yeah, 'cause our whole class is doing it. So we're doing it around for water, and how heavy it is for women to go out and carry all that water and go over to the lakes and put them in buckets and carry them on their heads. And it can also hurt their backs a lot because it's really heavy. And every two minutes, a child dies from a water-related disease. If you and your mom, because it's usually the women and the girls, if you had to walk down to Lake Ontario and then carry the water back on your head or in big jugs, because that's the only place you can get it, wouldn't that be horrible? Yeah, and then it would prevent you from, like, getting an education and stuff. So have you ever had a child in here being interviewed before? Have I ever had someone like you interview me? Never. This is very exciting and, as I say, I'm very nervous. Yeah, it's very exciting for me too 'cause I've never done anything like this before. And why did you want to? Why did you want to talk to me? Well, first we were going to try [Governor General] Julie Payette, the astronaut, but she was away. (Laughs) Moving down the list, yeah. So we decided to do you and I was actually listening to As It Happens at that moment. And what did you think when we called you back? My dreams? To become a singer or a journalist or a teacher or an astronaut or a scuba diver. This has been edited for length and clarity. For more, listen to our interview with Ivy Brooks.